Yes, this Thursday (July 25th) is Crazy Daze in downtown Northfield. But you probably already have it on your “must do” calendar. 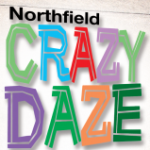 Starting at 7 a.m. with activities until 7 p.m., it’s a whole lot of fun brought to you by the Retail Committee of the Northfield Area Chamber of Commerce. Division Street will be closed from 2nd Street to 5th Street from 6:00 a.m. to 7:00 p.m. So make like a pedestrian and have somebody pick you, and your Crazy Daze deals, up when you’re good and ready.